The first emergers of Spring. Alaska is commonly referred to as The Great Land because in many respects its the largest, grandest and most magnificent -- a concept originating with the first settlers who crossed the Bering Land Bridge from Asia 10,000 years ago. Fly-fishing in Alaska embodies that spirit and offers a great wealth of opportunity for those fortunate enough to experience the scenic wonders and amazing fisheries of the Last Frontier. For decades many of the well-known destination spots in the state have been popularized and published.....and rightly so. But most are now a far cry from the Alaska we envision in our mind's eye and imaginations. As angler numbers and pressure grows among these favored spots, overlooked gems have begun shining through, in spite of the crowds. Stillwater may be Alaska fly-fishing's "best kept secret" and whether along the road system or beyond, countless lakes offer unbelievable fisheries of wild rainbows, arctic char, Dolly Varden and arctic grayling, as well as lake trout and northern pike. In addition to these under-utilized wild stillwater fisheries the Department of Fish & Game has an extensive stocking/planting program throughout southcentral Alaska and other areas of the state providing a wide variety of stillwater fly-fishing opportunities in lakes which previously had no fish present. Arctic grayling, rainbow trout, lake trout, coho salmon, king salmon and arctic char are stocked in both catchable sizes and as fingerlings where the small fish grow up and mature just as natives would in this system....and the results are high quality fisheries which can rival some of the wild lakes, yet may only be five or ten minutes down the road. Some lakes may even provide 2, 3, or 4 different species to fish for during a single outing. And an angler will rarely be able to tell the difference between the tenacity of a wild fish and a stocked fish in Alaska's lake systems. Fly-fishing Alaska's lakes is mostly an after-thought on anglers' lists with little if any time devoted to participating in these fisheries. With the vast majority of Alaskans and travelers focussing their efforts on the predominant salmon runs of famous streams and the trophy-sized resident rainbows, grayling, and char which lurk in those flowing waters, the stillwater fly angler will find much peace and solitude on Alaska's lakes....even those just minutes from metropolitan areas. Fly-fishing for trout, char, and grayling in Alaska lakes is probably 2 to 5 times more successful than fishing these waters with spinning gear, lures, and bait. These fish are no push-overs and are often very finnicky when it comes to striking traditional gear. Yet a nymph or dry fly pattern may produce fishing action during the evening rise that will last longer than your casting arm, and I've fished many times til 3am in Alaska's twillight before saying "enough! ".....while at the same time being the only one on the lake amid dozens of rising fish. The arrival of Spring generates a lot of fishing enthusiasm in Alaskans who have waited patiently through a long winter. But opportunities are scarce in the beginning, with the first fishable waters in April being the streams and rivers after ice-out. Unfortunately spring is also spawning season for Alaska's resident rainbow trout and many streams, especially those on the Kenai Peninsula, are closed to rainbow trout fishing until mid-June. Those streams that are legally open to fishing are either barren of fish (the fish are still in area lakes or the mainstems of major rivers) or difficult to fish due to high water from spring runoff. April is a good month for checking, repairing, cleaning, and tuning your tackle and gear before the season starts. The month of May is when most lower elevation southcentral lakes thaw out and open water begins to appear. And here is the fly-fisherman's first truly exceptional fishing opportunity, weeks or months before the arrival of salmon runs or the movement of resident fishes from lakes into streams. Rainbows, Dolly Varden or char, grayling, lake trout, pike and stocked coho & king salmon are readily available and especially vulnerable to fly-fishing techniques. The combination of conditions which are ocurring in Alaska's lakes during Spring breakup and ice-out provides a huge jumpstart to these ecosystems and their inhabitants. As shallow near-shore waters begin to warm beneath the ice from the sun, an open water zone in the ice cover appears around the lake edge. Open water means more oxygen which in turn draws fish which have been stressed from declining oxygen levels of late winter. At the same time, this near-shore open water becomes significantly warmer than the rest of the ice-covered lake. Heat promotes insect activity and initiates the first spring hatches which in turn are a magnet for the lake's fish population. The warmer waters also increase the metabolic levels of the fish making them more active in their pursuit of food sources. These open water zones around the lake may persist for a week or longer depending on the weather conditions and rate of breakup. During this period fish often travel parallel to the shoreline and just under the edge of the ice picking off unfortunate emerging insects which missed the open water lead and hit the underside of the remaining ice. Once the ice cover is gone fish begin to disperse throughout the lake although there are specific areas of the lake which they will prefer to gather at and feed due to the environmental conditions. By becoming more familiar with the underwater topography you may be able to tip the scales in your favor even on a "first time fished" lake. A little homework ahead of time can make a significant difference in your success and with the information now available no one should head for a lake cold turkey. As soon as there is open water around a lake its time to start thinking FISH. You don't have to wait until the ice is completely gone. And the early Spring fly patterns an angler will need to bring along are very basic and uncomplicated. The first available emerging insects on Alaska's lakes are usually the chironomids, or midges. These diminutive flies are often referred to as "gnats" by the unknowing and their tiny size might give the impression that their value in the food chain is insignificant. But when they are the only game in town after a long dark winter, they are taken by the lake's residents in huge quantities. Midges are relatively slow to emerge particularly when its cold and often struggle in the surface film with their abdomen hanging straight down making them very vulnerable during that time. Fish rising and appearing to be feeding on the surface are most often taking these emergers just under the surface. There are two methods used very successfully to fish this pattern in #12 to #20 sizes. 1) Fish the standard pattern with a tiny split shot and let it sink, then slowly raise it toward the surface with a floating line. The fish key on the upward movement of the imitation as if it were swimming toward the surface and intercept it before it reaches the top. 2) Fish a floating emerger later in the hatch when there are many naturals on top and the fish's energy is best spent sipping off the surface. The floating version is tied with a tiny piece of foam above the thorax. Although the midge emerger patterns are the most successful lake pattern in Alaska in the Spring and take every species at some time or another, the aquatic fauna of our lakes does include larger versions of insect life. Damsel, stone, and caddis for instance all have nymph stages which are found in lakes. 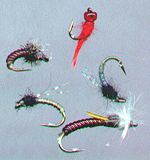 And whether the pattern of choice represents a real-life insect or a more generic imitation of food in general, nymphs are a pattern which can be easily fished by anglers of all ages and levels of experience. Its a durable pattern which young anglers can use/abuse and catch lots of fish with. The Pheasant Tail Nymph, both in beaded and standard versions, is a very popular pattern that should be in every stillwater angler's fly box. The unweighted, non-beaded fly is fished similar to the midge emerger. Use a tiny split shot to take it through the water column and then lift back to the surface to imitate a rising emerger. The beaded version uses a brass bead at the thorax and allows the pattern to be fished without additional weight. The glint provided by the bead also adds some attractor qualities to the fly and most realistically represents an air bubble which certain species of insects "ride" to the surface during their emergence. Bead Head Nymphs come in all sizes, colors and component variations. But their one common trait is they are all consistent producers on Alaska lakes in Spring and early Summer. 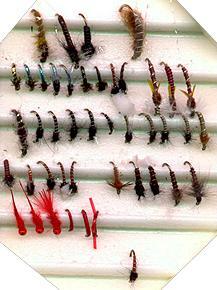 A wide assortment of colors should be included in the fly box as well as several sizes, from #10 to #14. Freshwater leeches are relatively common in Alaska's lakes, but whether a particular water contains leeches or not, resident fish will recognize this pattern as a representation of a high protein source of food. Most leeches hide among lily pads or aquatic weed beds, but there is relatively little aquatic plant growth in lakes during the first few weeks of Spring and Summer. Leeches on the move are extremely vulnerable and fish will take them without hesitation. The Wooly Bugger in a weighted black version using a #10 or #12 streamer and tied about 3 cm long makes an ideal size for trout, char and grayling. Its a very good pattern for fishing deeper in the water column or on cool days when few insects are emerging. Fly-fishing articles have very limited value if they can't put you into fish. So our goal here at Alaska Flyfishing Online is to provide useable content that results in success in the field. Fortunately there are now some extremely useful databases on the Internet which will allow every angler the opportunity to scout out a huge number of Alaska lakes with your computer before you even fill up the gas tank and head out...or step off the plane. The Wild & Stocked Lakes Maps developed by the Alaska Department of Fish & Game are a collection of PDF files which provide all the information you will need for 174 stocked lakes and 29 wild lakes in southcentral Alaska. Within each file you will find a bathymetric (underwater contour) map in 5 foot increments, the average depths, stocking histories, surface area, types of fish present, public access points, and usually Catch & Harvest data representing the amount of fishing pressure the lake has had during the past several years. Directions are included for the location of the lake. Our Check List column provides the links to those F&G pages which represent the map databases for each specific area. The Search Stocked Lakes link listed in the column underneath the map links will display a F&G page which allows an angler to search the fish stocking program database. These records have significant value for any angler wishing to find out the number of fish stocked in each lake, or a list of species stocked in each lake, in addition to the past stocking dates. This particular database is expanded to include waters on Kodiak Island and the Interior around the Fairbanks area. Suggestion: Use the first search section...choose the region you want a list of lakes for....then select ALL SPECIES. Leave the default start date and the radio button selection for LOCATION. Hit the Search button and you will get a list/table of every lake in that region, the dates it was stocked, the species stocked, the number of fish, and their size....either as catchables or as fry. Alaska's lakes are definitely a fly-fisher's dream come true. Whether its an urban lake in the middle of Anchorage or a lake five miles down a gravel road, they can provide some excellent opportunities with very little competition. Pump up your float tube, pull on your waders and you'll have the entire lake at your disposal. Just as soon as open water begins to show around a lake its time to grab the fly rod and vest. And for those readers who made it this far, here is a secret tip for early season success. When you begin to fish the lakes as the ice melts, focus your primary efforts in areas of the lake where sand or small gravel is present on the lake bottom. During the first few weeks after the ice goes out resident rainbows, even those in landlocked lakes, will go through a spawning cycle. Although they have no place to spawn, they will congregate around gravely or sandy areas in significant numbers because of their instincts to seek out this substrate. Keep your hooks sharp and good fishing!